He is on His throne, the Mercy Seat, surrounded by a rainbow of colors. Light is flashing everywhere. 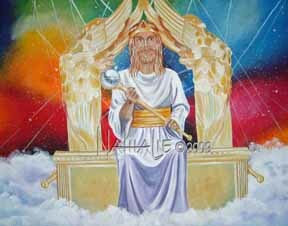 On his crown is a single drop of blood, He is wearing a golden girdle, and is holding a scepter. I was going to paint it with jewels but then it seemed that it needed to be one, single giant pearl, the Pearl of Great Price.